This MAb recognizes a protein of 130kDa, identified as Ksp-cadherin. Cadherins form a superfamily of related glycoproteins that mediate calcium-dependent cell adhesion and transmit signals from the extracellular matrix to the cytoplasm. Cadherins have been implicated in embryogenesis, tissue morphogenesis, tissue structure maintenance, cell polarization, neoplastic invasiveness and metastasis, and membrane transport. It is suggested that Ksp-cadherin is a marker for terminal differentiation of the basolateral membranes of renal tubular epithelial cells. Within the kidney, Ksp-Cadherin is found exclusively in the basolateral membrane of renal tubular epithelial cells and collecting duct cells, and not in glomeruli, renal interstitial cells, or blood vessels. Ksp-Cadherin has been suggested to distinguish Chromophobe Renal-Cell Carcinoma from Oncocytoma. Anti-Human, Mouse, and Rat Ksp-Cadherin Positive Control Sample: Normal kidney or renal cell carcinoma. 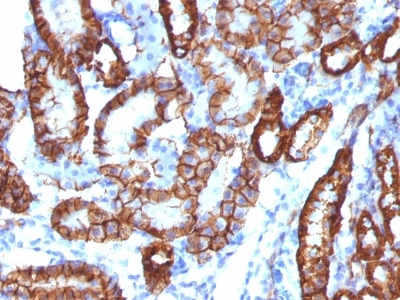 Variations in Ksp-Cadherin antibody staining intensity in immunohistochemistry on tissue sections are present across different anatomical locations. An intense signal was observed in cells in the tubules in kidney and glandular cells in the thyroid gland. More moderate antibody staining intensity was present in cells in the tubules in kidney and glandular cells in the thyroid gland. Low, but measureable presence of Ksp-Cadherin could be seen in. We were unable to detect Ksp-Cadherin in other tissues. Disease states, inflammation, and other physiological changes can have a substantial impact on antibody staining patterns. These measurements were all taken in tissues deemed normal or from patients without known disease. 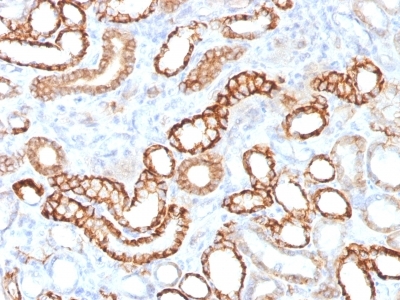 Tissues from cancer patients, for instance, have their own distinct pattern of Ksp-Cadherin expression as measured by anti-Ksp-Cadherin antibody immunohistochemical staining. The average level of expression by tumor is summarized in the table below. The variability row represents patient to patient variability in IHC staining. enQuire Bio's Ksp-Cadherin Recombinant Monoclonal is available for Research Use Only. This antibody is guaranteed to work for a period of two years when properly stored.